ULTRA HIGH VISIBILITY: Powered with small button battery, this LED Slap band provides 360 degree ultra-high visibility in dusk and night time activities. The brightness is much higher than the glow in the dark glow sticks. That means greater safety for you, your children or your pet from negligent and distracted drivers. LIGHTWEIGHT, SOFT, FLEXIBLE NYLON AND EXTREMELY EASY TO WEAR: designed with comfort in mind. The arm band is lightweight and can be used all ages. Comfortable On Both Children And Adults and Pets. To put it on, first straighten up the band and simply slap again the wrist, arm or angle part, it will curl wrap automatically. 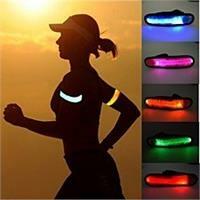 VERSATILE APPLICATIONS: This glow bracelet is extremely versatile. It can be used for runners, cyclists, campers, night walkers, auto safety, combine with safety vest, child safety, runner gear, longboard.